Separated from his son, only a galaxy stands between him and home... The year is 2154, and Corvus Ranger, space pilot and captain of the Soliton, embarks on a penal run to Jupiter's prison moon, Europa. It should be another routine drop, but a motley band of escaped convicts have other ideas. When Soliton is hijacked, Corvus is forced to set a new destination, one which is far from Earth and his son. Unable to fight (or smooth talk) his way to freedom, Corvus finds himself tied to the plans of the escapees, including their leader Isidore and a gifted young boy who seems to possess strange abilities. Desperate to return to Earth and the son he left behind, Corvus is thrown into the ultimate adventure, a star-strewn odyssey where the greatest enemy in the universe may very well be himself. 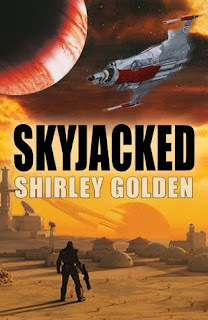 Skyjacked by Shirley Golden was exactly the read I needed. I'd finished a couple of amazing books and was stumped with what to pick up next and skipped over a ton of books before cracking open Skyjacked. I love the cover; the lone figure contrasted against the alien planet scape. The bold, one-word title fits perfectly. This SF takes a clever assortment of characters and confines them on Soliton, Corvus' ship. Golden cleanly defines her characters, pointing out the pointy parts of their personalities, and then throws them in together. Skyjacked has constant action and fluid character dynamic as they succeed, fail or find redemption. I really liked Isidore, Shai and Janelle. The three female leads in the story displayed confidence and strength. I felt Golden nicely setup and supported them, then let them go at it. Their decisions felt genuine and natural. All together a really enjoyable SF. Recommended!